I have one unit where the volume is stuck at 14. When I press and hold the volume button (after turning it down to 0), the power turns off, as it is also the power button. I hold it forever and nothing happens. I have another unit where the volume is stuck at 0. Any suggestions? Now, does any body knows of a way to reset the clock? How can I get a new Antenna for the back remove able one on the back of my Boston horizon solo. I still have the plug but the wire has detached from the plug. I have the wire. Is there a way to put it back in? Does someone know how to replace internal battery? My clock radio does not keep the time if electricity goes down. It did in the past. Intermittent volume-cuts in and out with constant static-with my horizon duo I.
HELP-Please! I love this radio but can't afford to buy another. Thanks all, for ALL you do to help the electronically handicapped. Well, now. In doing some web searching I just happened across this by chance, and found the pleasant surprise that there was a simple fix for a problem with my radio that suddenly appeared, what, probably a couple of years ago. Since the radio more or less still worked, I sort of just resigned myself to the thing having malfunctioned, and maybe at some point I would buy another one. I was actually searching the web to see if there was a local store selling them. So cool to suddenly discover that there was a basic explanation for the problem with a quick simple fix, not mentioned in the manual at all for some reason despite coming with a fairly thick manual for a simple clock radio! It's extremely weird to have had that problem suddenly appear, for no apparent mysterious reason. Reading the description, the "hospitality mode" for the kind of settings mention is actually a really nifty design idea. Just bizarre that this would suddenly kick in for some unknown reason. Gracias!! I thought the radio was cooked. Made me a very happy camper. 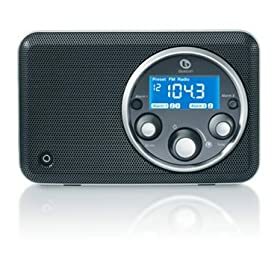 This radio has a function which enables the time to be on display while radio is playing. I had the unit setup to operate that way but while setting the DST I screwed it up and now time is on display only while radio is off.